KIEV, December 19. /TASS/. The birthday of leader of the extremist Organization of Ukrainian Nationalists (OUN, outlawed in Russia), known as Nazi collaborator, Stepan Bandera will be officially celebrated in Ukraine, the parliament said in its resolution on Wednesday. "Stepan Bandera was an outstanding figure and theorist of Ukraine’s national liberation movement," the Verkhovna Rada’s resolution said, according to 112.Ukraine TV channel. 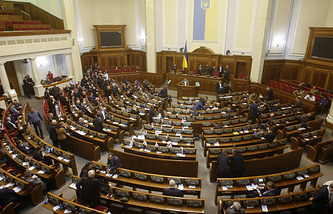 In May 2015, Ukrainian President Pyotr Poroshenko signed a law glorifying the OUN and the UPA, whose activities had been previously designated as ‘struggle’ for the country’s independence. Monuments to Stepan Bandera and Roman Shukhevich - the leaders of the 20th century Ukrainian nationalist movement - have been erected across Ukraine, memorial events and torchlight processions take place in their memory, and streets are named after them.